ESTRA Seattle Official Car Accident Blog: Can Insured Civil Rights Help Injured? Can Insured Civil Rights Help Injured? Insured Civil Rights promotes fair reviews of Auto Insurance and Employer Benefit Claims. 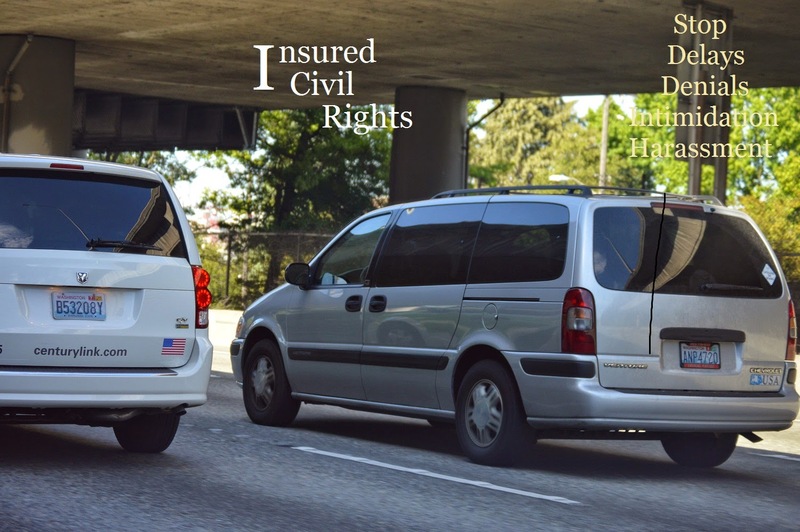 Seattle (ESTRA) - Why Insured Civil Rights? Many people injured in Car Accidents can spend up to ten years waiting for a fair and equitable settlement, only to be worse off by the end of their claim. In fact, far too many find themselves living at poverty levels by no fault of their own. Congress supports the Insurance Industry through their interactions with Lobbyist, allowing a lack of legislation which could aid insured in receiving prompt payments and legal avenues to move their claims forward in a timely manner. Insured Civil Rights could make this possible and empower Car Accident Victims by creating a level playing field to Insurance Companies with vast wealth and influence. Most individuals start each morning planning on what needs to be accomplished during the day. The last thing on their minds is an unexpected collision. Those who walk away are lucky. Those injured will have to overcome their physical and or emotional trauma. The most unfortunate, are the ones who are unable to walk away, and have their lives taken. After any accident, most will have to deal will an Auto Insurance Company at minimum. This interaction can be a positive or negative experience. Or move from one to the other. They key is understanding what this process will mean to you, and it’s impact on daily living. Many people involved in a car accident must also deal with Employers, too. Learning in advance about rights, responsibilities, past and present behaviors of the corporation will aid in making a plan on how to deal with processing claims, and learn the type of treatment that is customary from those you interact with including an initial interview with auto insurance carriers, request for property damage estimates, request for medical conditions, wage loss request, claim applications to fill out which give authorization from them to receive information directly, just to name a few tasks most people go through. Insured Civil Rights would give the injured an opportunity to be compensated in fair, timely, and appropriate ways. There needs to be deterrents in place against delays, denials, and intimidation to eliminate legitimate personal injury claims by those corporations that benefit from the premiums of insured and choose to pay claims or keep the money. Insured Civil Rights Legislation in place to protect the rights of injured, supports personal injury victims ability to defend themselves and receive benefits when it can do the most good, immediately. Insured Civil Rights would eliminate auto insurance policies with clauses which negatively impact their client’s ability to receive settlements in short periods which helps recover from circumstances. The mission of Insured Civil Rights is to provide individual protections when a participant in Employer Group Benefit Plan or consumer with an Auto Insurance Policy is involved in traffic collisions and find themselves at the mercy of bad faith practices. Legislative Protections in place which denies corporations the rights to stall processing insured claims unnecessarily, thus, creating personal harm and financial losses in order to cause desperation and willingness to settle for far less benefits because of survival needs. By approving Insured Civil Rights Legislation injured could expect help in a reasonable amount of time, just as in the case for vehicle property damage or commercial claims request. Why should Employer Group Plans or Individual Auto Insurance Plans be excluded? Every person deserves to be treated with respect and dignity. And thankfully, many do remember this basic virtue. Yet, sometimes a community or country forgets this simple message that fairness promotes a healthy community and society. When unfair practices occur on a regular basis against insured, too many of their lives spirals downward, dashing hopes and dreams for recovery or a better future. Eliminating or reducing productivity of those individual who could once again aid in making their communities and country great. Again, disrespect breeds dissatisfaction, delivering negativity to those unable to merge it with good things to squelch distrust, disbelief, and treachery, which begins to reduce the quality of life for everyone. In summary, Insured Civil Rights can be define as the ability of insured to be protected from lengthy delays, denial, or extensive court trials use to cause serious harm in order to reduce fair settlements and intimidate people injured in Car Accidents. Going through the claim process in my opinion, is like navigating a maze with cake and scorpions. And by the end of the process you never know if the help promised in a difficult situations, will protect against losses, meaning the cake, or, struggling with pain, suffering, and losses, due to not receiving the help you thought would be received, which represents the scorpions. Therefore, do not invest too much hope in receiving the care and services promised, because the level of treatment is typically subjective, in my opinion. Be best advocate in this situation by taking care of yourself. And if you receive fair treatment from Insurance Carriers, tell this story too. Frankly speaking, lobbyist and the insurance industry have too much control over decision making of settlements. An intermediary between the company taking in premiums and paying out claims would provide objectivity in making determinations. When the same people who have a vested interest in not paying out personal injury claims are the same ones who decide whether to pay it, in my opinion, injured are placed in a vulnerable position. These carriers make the choice whether to pay immediately, which by the way, is occurs with a corporate claim. This rarely happens for individual involved in a serious claim. Next, Insurer can decide to delay claim, which in most cases harms the insured due to a lack of income to resolve immediate problems themselves, hence, reason for the insurance policy in first place. Many families have suffered undue stress because of personal injury where work time is lost, and savings are minimal. A third option for an insurance company is to outright deny claim or force insured to file a lawsuit against them. From my perspective, this happens mostly with those individuals with least resources because many may give up claim. The Insurance Industry has profited significantly on the backs of their insured, many whom are unable to bear such a heavy burden. An Insured Civil Rights would be an added protections against many of the injustices faced after filing a claim against a policy. The goal is to provide the assistance policyholder before incurring significant losses. In this way, no clauses or bad faith behaviors could allow these large corporations to delay and deny policyholders help needed to overcome problems which arise from being in a car accident. There has been an increase in the number of companies offering Pre-Settlement Loans, which come with a high cost to insured. Yet, many have few alternatives now in order to survive hardships cause by collisions. This one sided level of power hinders insured ability to protect themselves from unfair or slow payments by Insurer. An Insured Civil Rights could put protections in place to solve many of these issues. Most people can understand the crucial need for a steady source of income. In fact, this is main purpose for auto insurance, unemployment, or long term disability, and social security. These systems are in place to help protect individuals when something goes wrong, and provides support in times of trouble. When those systems fail poor and middle class families, many do not have the resources to adequately recovery from these concerns and many people would fall down with little means to lift themselves up again. When Insurer's make decisions not to support insured as described in policies large print, many clients miss fine print, or extended number of pages to read through, where corporate lawyers slip in a few clauses to allow them to skip paying claims. The auto insurance industry knows how devastating a lack of income can be to a person injured in a traffic collision. They know most are under a great deal of pressure already financially. And, unfortunately, some of them will used this against their own insured and make life more difficult instead of being there to relief some of their pain and suffering per insurance policy agreement. Insurance Companies and corporations like them are supposed to be light in a dark time for their insured. In fact, this is what their clients depend on. Each and every time a client is let down by this industry, is shines a light on bad faith or unfair practices. As has been documented by research, a dissatisfied customer tells more people about what has happened to them than a content one. And, by looking around the Internet, it is easy to see these stories are growing. Investors may be impressed with larger bottom lines, but insured certainly are not when their claims are delayed, denied, or fought in court for a fair settlement. There was a time in our country where our leaders lead from in front, where integrity and pride in personal accomplishment stood tall above all else in society. Sadly, it appears more and more leaders are leading from behind, and the quality of choices they are making shows. Lets hope this behavior is soon placed in remission, being replaced with greater respect and dignity for claims from the insured. Let the world once again can see the value in respecting those who use what they have responsibly, especially when they have been made giants by those with the least.